August 18th 2006 - Miami Beach, FL - Walter E. Jagiello, known as Li'l Wally the Polka King to millions of fans worldwide, passed away Thursday, August 17, 2006, at the age of 76. Li'l Wally became famous for his Chicago style polka, a slower style of polka that he introduced in the 1940s on "Polish Broadway". 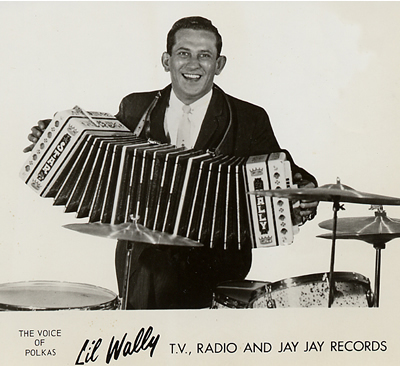 Li'l Wally has been entertaining generations of polka fans for more than 60 years. His career began in Chicago's northwest side in 1938. Wally quickly rose to the top of his profession with hits like Wish I Was Single Again and Puka Jasiu (Johnny's Knockin'). He had 17 gold and four platinum albums, appeared on numerous radio and television shows, and entertained all over the world. Wally received a number of awards throughout his career, but he always felt his greatest honor was an invitation to play for Pope John Paul II in the Vatican in 1984 where he played his song God Bless Our Polish Pope. In 1965, Wally moved to Florida with his wife Jeanette where he continued to produce records, do concert tours, and mentor young musicians. Wally loved music and was often heard to say that he wanted to die on stage playing polka music. He will be sorely missed by fans all over the world. He is survived by his wife Jeanette (nee Kozak). Services will be held in Chicago on Saturday, August 26th, 2006 at the Pietryka Funeral Home at 5734 West Diversey. More information may be obtained by phoning the funeral chapel at 773-889-0115. Copyright ©2015 Jay Jay Records. All rights reserved.